Q:Can these boxes be used for anything after event? Q:Is there a way to get all of the different names of my guests printed for each label? I only saw two text boxes to enter names for the label, and I have about 30 names I would like to personalize for the cupcake holders. A:For pre-printed labels, all the labels would need the same personalization. The minimum order is 2 sets of 12. Included with the boxes are matching blank labels that you can use to handwrite your guests' names instead of getting pre-printed labels. 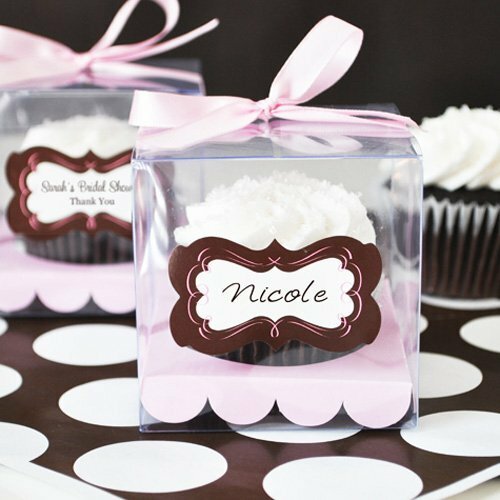 Our adorable personalized cupcake favor boxes are the perfect way to package birthday cupcakes on your special day. Cupcakes sit in your choice of a pink or white scalloped base; clear box containers perfectly envelope your scrumptious treats and are sealed with a coordinating satin ribbon. Included with the boxes are matching blank labels that you can use to handwrite your guests' names. Or you can add personalized labels with up to 2 lines of text. 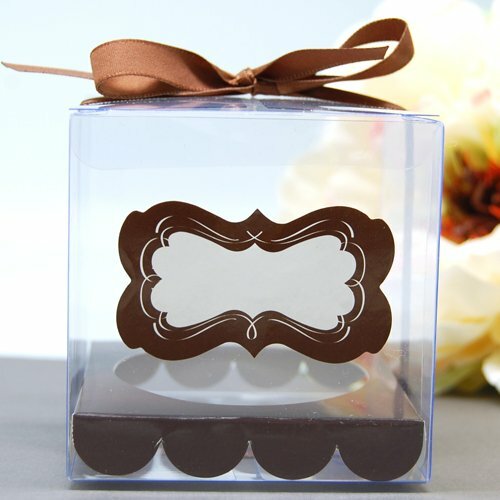 Each set of 12 contains: 12 clear boxes, 12 scallop edge cupcake holders, 12 pre-cut satin ribbons, and 12 blank labels. Please note that personalized labels will arrive separate from boxes; some assembly required. Box measures 3"L x 3"W x 3"H and holds a standard-sized cupcake.